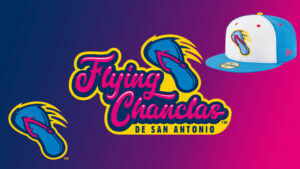 Every Thursday home game this season starting May 5, the Missions become The Flying Chanclas. Judging from the enthusiastic turnout and clamor for Flying Chanclas-related hats, shirts and other items, this promotion is a huge success, and one that likely will be repeated in seasons to come. As you probably know, chanclas is Spanish for thong sandals. The Flying Chanclas is a direct reference to the mostly urban legend of sharp-shooting Hispanic mothers and grandmothers using their comfortable footwear to correct misbehaving children immediately, even if they are not within arm’s reach. There was even a scene in the Oscar-winning Disney animated movie “Coco” where the abuelita threw her sandal. Which got me to thinking about the humble flip-flop. They are often worn year-round in San Antonio, but thanks to rising temperatures, they will be making even more of an appearance as the summer begins to heat up. Now most thong sandals are perfectly appropriate for the pool or a short walk outside. The danger for most people, however, is not from having them thrown at them, but from wearing them too long. Just take a look around at what is on people’s feet at the mall or grocery store. Many thong sandals have no arch support. There is little to no cushion on the heel. It’s like wearing a pancake on your foot, or being barefoot. If your foot mechanics are such that you are prone to Achilles tendinitis or plantar fasciitis, being in an attractive sandal with no support is only going to aggravate your pain. Another problem is because you just slide into a thong sandal, you may not realize it’s too big for your foot. To understand the danger here, you need to know a little about the mechanics of walking. Most people land with their heel to the middle of their foot, and push off with the big toe. It’s called the gait cycle. If your shoe is too big, you tend to slide off and favor one side over the other, wearing down that spot on your shoe more quickly. Since thong sandals already have thin cushions, this is very dangerous for your feet, as walking on almost no cushion leads to stress on your feet, and eventually to injury. It’s also important to note that thong sandals are really not meant to be worn on uneven surfaces. You’re more likely to fall and twist and ankle if you decide to go rock climbing in your chanclas. And with no side support on a sandal, it means greater chance your feet will slide around in your shoe, which becomes even more aggravated if your shoe is too big. So if you have had a comfy pair of flip flops in your closet for a couple of years, think about tossing them and shopping for some new ones that fit properly, have some arch support and a good cushiony sole. You may want to consider buying local and looking at the inventory at SAS Shoes. I have found they make stylish, well-built shoes that are also good for your feet. If you need to send your new chanclas flying, chances are you will still be able to hit your mark. More importantly, your feet will thank you for it.